Here are a number of items that make your home much safer for your loved one who may have mobility issues. We sometimes forget about how easy it can be for someone with mobility issues to fall and get injured. GRAB BARS: Grab bars come in many lengths, and different installation methods. You can select basic grab bars that screw into the wall or there are models that are "NO DRILL" versions that install with contact cement. The use of these are not limited to the bathroom, as many people think. Placing them in hallways, next to stairs or even next to the bed can be a simple addition to the home to prevent loss of balance. TRANSFER BENCH: This is a great item to assist your loved one to get into the tub/shower area without needing to step over the edge of the tub. The transfer bench straddles the edge of the tub with the suction cup legs inside. All you need to do is sit on the bench, and slide over the edge. RAISED TOILET SEAT: Toilet Seat risers are a great item, easily installed, that help your loved one transfer onto and off of the toilet. You can select models that raise the seat either 3 1/2" or 5". 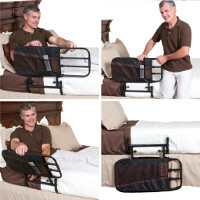 This is a great item for anyone with hip, shoulder or knee issues. This item helps relieve pain in the joints while getting up or sitting down. LIFT CHAIRS: It is almost impossible to find a lift chair that would not work for a loved one with limited mobility. They come in MANY sizes, and it is VERY important to find the correct size for the user. (If you are shopping for a lift chair, and ARE NOT asked the height and weight of the user, you are in the wrong place!). Just as a Raised Toilet Seat helps get the user on or off the toilet, a Lift chair helps the user to a standing or sitting position, while limiting the strain on the joints. Lift chairs are ideal for anyone with mobility or BALANCE issues. Lift chairs encourage activity and independence by helping people to stand - safely. Standing sometimes is accompanied with dizzyness, which can lead to dangerous falls. Lift chairs can reduce this risk by reducing the effort needed to stand. STAIR LIFTS: Stair Lifts have become more and more popular with senior citizens who have limited mobility, but want to stay in the house they made a home. Stair Lifts come in outdoor models as well, which many do not know. You can get a Stair Lift for a straight or curved set of stairs. They have a battery backup system installed so the user can still use the stair lift even if power goes out at the home. They come with remote controls so you can remotely bring the stair lift to the top or bottom of the stairs, if necessary. And a great feature of the Stair Lift is that it folds out of the way so others can use the stairs as well. All of these items, and even more, are available at All-Star Medical in Franklin or Hermitage. Please come by, visit our website or give us a call to discuss how we can help you with making the home a safer place for your loved one.